​One sure sign that spring is arriving in Pennsylvania is the appearance of people planting trees along streams. Why spring? It’s good to plant trees and shrubs when they are dormant, either in early spring after the ground thaws and before buds break out, or in the fall when the leaves have fallen off the plants. Pennsylvania has a goal of planting 95,000 acres of forest buffers along waterways throughout the state by 2025 (that’s an area larger than the City of Philadelphia). In 2013, the commonwealth had credit for 54,843 acres of forest buffers with the federal Chesapeake Bay Program. Despite several years of adding thousands of acres, in 2015, only 250 acres were planted. DCNR Secretary Cindy Adams Dunn recently told several hundred people gathered in Harrisburg for the Riparian Forest Buffer Summit that the numbers are increasing. DCNR has provided $4.5 million in grants over the past several years for buffers. Many of those acres have yet to be installed. The more than 60 members of the Riparian Forest Buffer Advisory Committee discussed buffers and flooding at its most recent meeting. Last year, Pennsylvania experienced its wettest year on record. Climate change is expected to cause bigger and more frequent storms. Floods are caused when the rain cannot soak into the soil fast enough. Areas that are critical to flood control are often distant from the mainstem of a river. Riparian forest buffers and forests are especially helpful in the headwaters of tributaries. Live staking is a practice that is low cost, and is something that land owners can easily do on their own property. Live stakes are living shrub and tree branches that root readily when inserted into the soil. The process introduces plants directly in the places that need it most -- the stream banks. Stem cuttings are taken from trees before the buds break out in the spring. They are then inserted directly into stream banks where they establish a root network and help prevent soil loss. Secretary Dunn this week helped harvest Elderberry and Silky Dogwood from a property near Lewisburg. 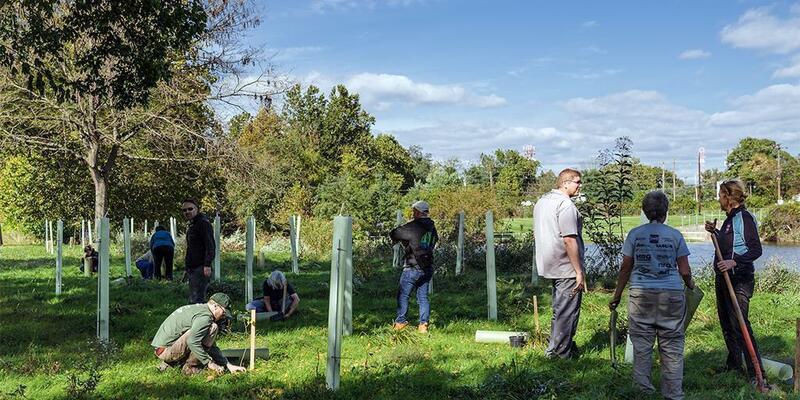 DCNR is partnering with Susquehanna University, Chesapeake Conservancy, and the Merrill W. Linn Land and Waterways Conservancy to collect approximately 8,000 live stakes across Union, Centre, and Snyder counties over a total of four volunteer days. These free cuttings will be distributed to nine project partners, and embedded into 2.5 miles of stream banks for forest restoration projects later this year. There is one more volunteer opportunity to assist with collecting live stakes on March 24 (PDF). Penn State Extension provides additional information about live staking for stream restoration.